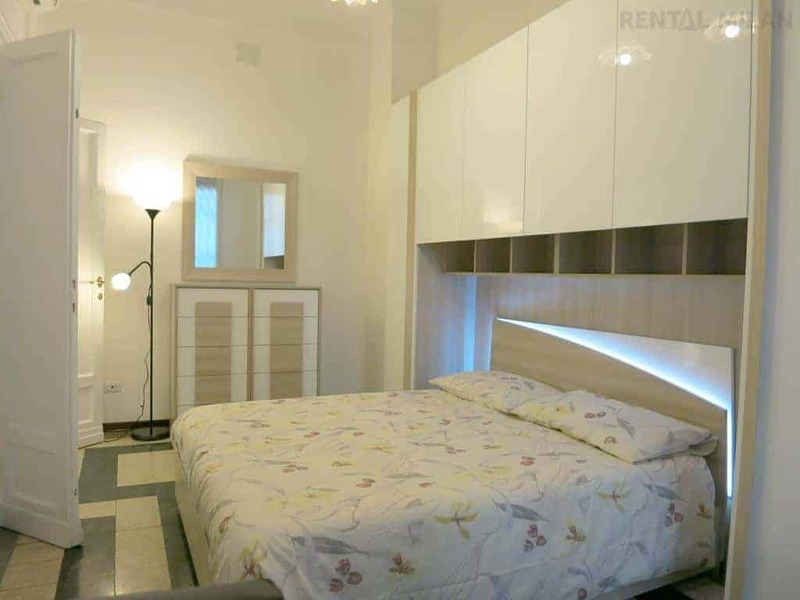 Apartment Milan with 2 bedrooms. Just totally renovated, modern brand-new furniture. From the hall, on the right you have a large bedroom with a single bed and a French bed (cm 140 wide). A desk and a wardrobe. Wooden floor. Facing the entrance, there are 2 rooms: a modern fully equipped kitchen with table/chairs and a bathroom with shower, washing machine and window. On the left there is the 2nd bedroom with a double bed, table/chairs, wardrobe and TV. The apartment is on the ground floor, facing the trees of a quiet street. 40’s building in perfect conditions with doorman service. The apartment is located in Porta Vittoria, a beautiful district in Milan where modern buildings are rising. Just a few meters from the apartment there is the new access to Porta Vittoria station. It’s a strategic station, because it’s a metro and train station as well. Every kind of shop and service are walking distance. You can reach Rho Fiera directly by train in about 20 minutes. Duomo, the city center, is just 15 minutes by public transports. Quiet and safe residential area.